Adapting to the ever-changing GMAT exam, Manhattan Prep's 6th Edition GMAT Strategy Guides offer the latest approaches for students looking to score in the top percentiles. Written by active instructors with 99th-percentile scores, these books are designed with the student in mind. Adapting to the ever-changing GMAT exam, Manhattan Prep's 6th Edition GMAT Strategy Guides offer the latest approaches for students looking to score in the top percentiles. Written by active instructors with 99th-percentile scores, these books are designed with the student in mind. The GMAT Integrated Reasoning and Essay strategy guide demystifies the Integrated Reasoning section, which demands a blend of mathematical and verbal proficiency. This book equips students with the core strategies and tools for tackling difficult Integrated Reasoning questions. It also provides effective techniques for approaching the essay portion of the GMAT. 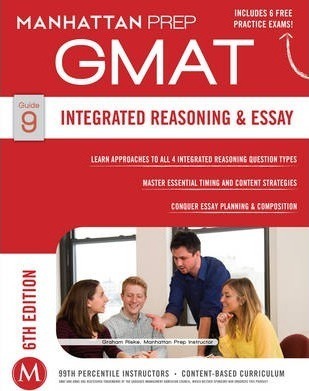 Unlike other guides that attempt to convey everything in a single tome, the GMAT Integrated Reasoning and Essay strategy guide is designed to provide deep, focused coverage of one specialized area tested on the GMAT. As a result, students benefit from thorough and comprehensive subject material, clear explanations of fundamental principles, and step-by-step instructions of important techniques. In-action practice problems and detailed answer explanations challenge the student, while topical sets of Official Guide problems provide the opportunity for further growth. Used by itself or with other Manhattan Prep Strategy Guides, the GMAT Integrated Reasoning and Essay strategy guide will help students develop all the knowledge, skills, and strategic thinking necessary for success on the GMAT. Purchase of this book includes one year of access to Manhattan Prep's Integrated Reasoning and Essay Question Bank. All of Manhattan Prep's GMAT Strategy Guides are aligned with the GMAC Official Guide, 2016 edition.